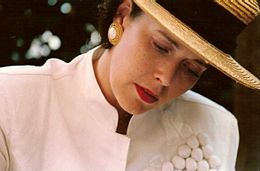 B' e cleasaiche às na Tìrean Ìsle a bh' ann an Sylvia Maria Kristel (Utrecht, 28 an t-Sultain 1952 - Amsterdam, 18 an Dàmhair 2012). Bha i gu math ainmeil fad na 70an airson an fhiolm Emmanuelle. Chaochail i le aillse ann an 2012. Air a tharraing à "https://gd.wikipedia.org/w/index.php?title=Sylvia_Kristel&oldid=537290"
Chaidh an duilleag seo a dheasachadh 16 dhen Lùnastal 2017 aig 15:00 turas mu dheireadh.